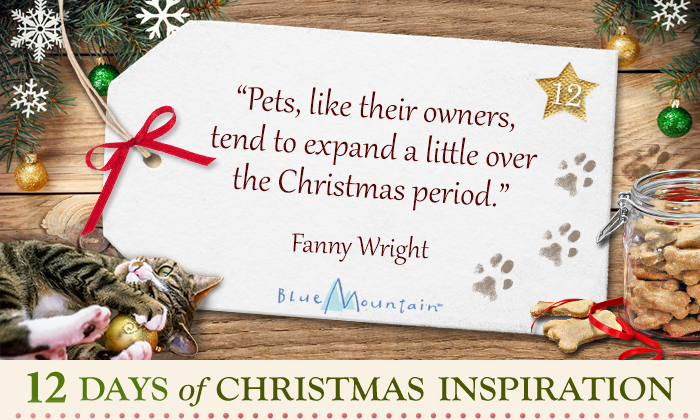 The halls are coming to life with evergreens, scented candles are glowing, baked goods are cooling in the kitchen...and your furry friends are wide-eyed with delight, ready to indulge in them all. 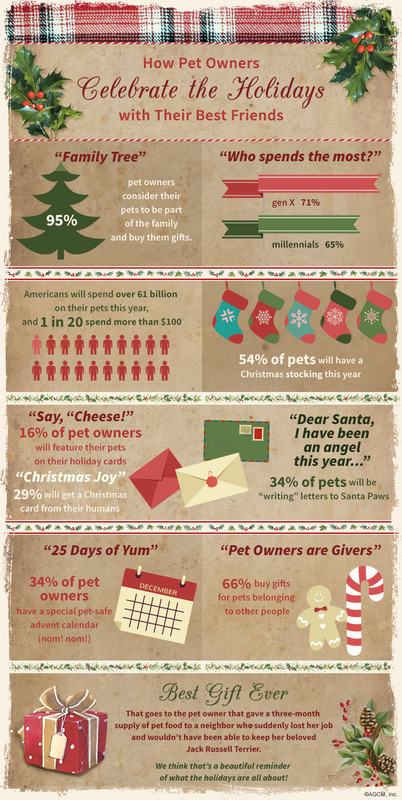 When the holidays are here, we naturally want our pets to celebrate right along with us. They're not just pets to us, but our loyal companions, our friends, and our family. But all that joy we're spreading around them may unknowingly do them harm, so especially at this time of year, it's a good idea to keep these five safety tips in mind so you and your sweet friends truly enjoy the most wonderful time of the year. Pretty, but dangerous plants. "Oh by gosh, by golly, it's time for mistletoe and holly..." but it's not time for you to have to rush your little loves to the emergency room. When ingested, this iconic duo can cause nausea, vomiting, diarrhea, as well as gastrointestinal upset and cardiovascular problems. In addition, Lilies can cause kidney failure in cats. So if you know your pets like to graze, keep plants up high on mantles or where they can't be reached. If you think you're out of the woods with potpourri, sorry friends-it's toxic when eaten. Consider just-as-jolly silk or plastic plants, or pet-safe bouquets. Dangerous decorations. Almost all veterinarians hate tinsel and for good reason. It's a foreign body waiting to happen, as cats are notorious for swallowing string. It very often will require surgery if swallowed. While garland tinsel is a little bit better, since it does have tiny strings it can still cause an obstruction, so keep a close watch. 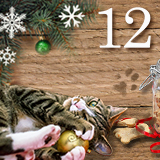 Glass ornaments can cause serious lacerations in the mouth if bitten into, and if they break, sensitive paws are at high risk for serious cuts. Edible ornaments are never a good idea. Always remember, too, to keep those electrical cords hidden and well out of harm's way, along with batteries. 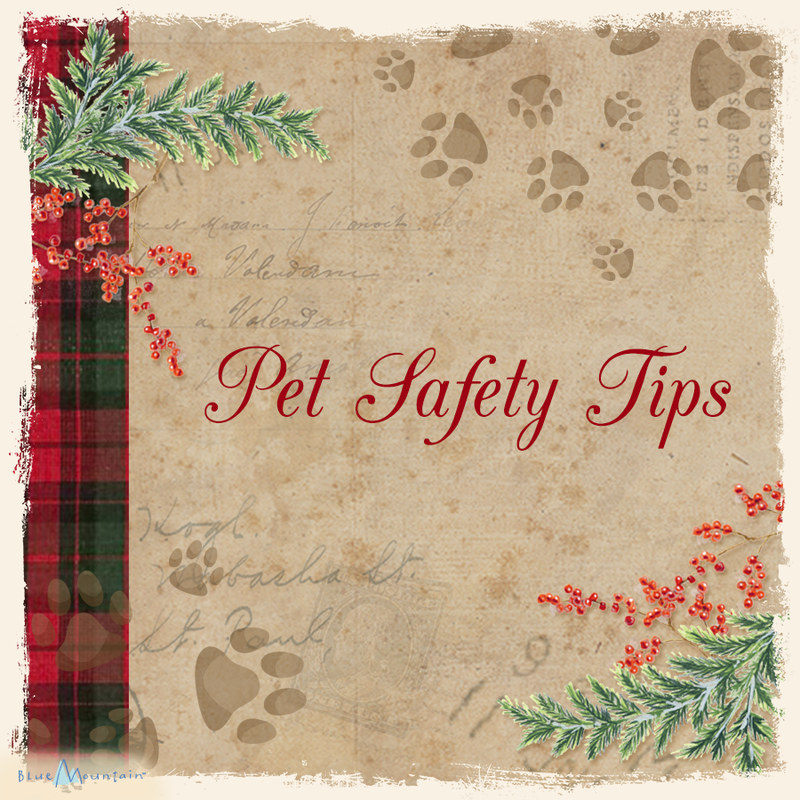 Many of you have pets that have been with you for years, so we know you know how to practice due diligence, but all of us can use a good reminder of safety precautions during the bustling holidays. You may want to keep these tips handy for friends and visitors, so they, too, will treat your pets in the best way possible, making it a happy, safe, and enjoyable holiday season for all! The holidays are approaching, and it's a popular time of year for taking family photos, as well as photos specifically for Christmas cards. These special photos wouldn't be complete if they didn't include our pets too, but we all know that pets have a mind of their own, and getting them to cooperate can be a little tricky. We recently sat down with American Greetings onsite photographer, Audrey Jones to get a few of her best tips for photographing animals. My favorite thing about being an animal photographer is the constant challenge to make the best out of every situation. 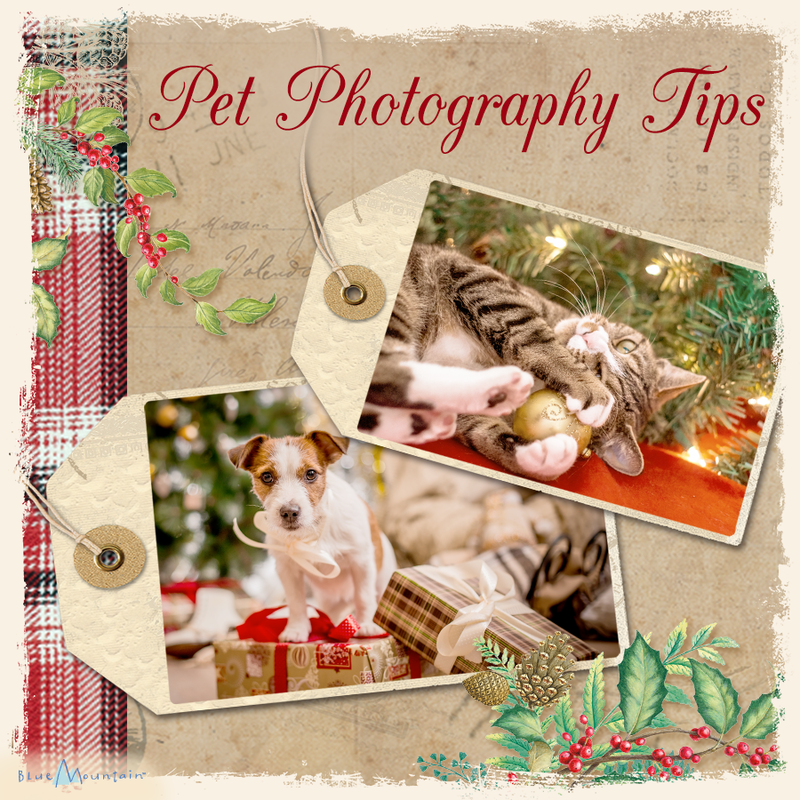 Here are 5 Pet photography Tips to help make your next pet photo session much easier. I often find that pets are more comfortable in familiar environments, such as their own home. Studio set-ups with strobe lighting tend to freak animals out, making it harder for your pet to stay calm. When choosing which room to photograph within the home, look for the room with the best natural daylight. Favorably, a large bank of windows would be ideal to front or side light your pet. If the light coming thru the window is too harsh then I recommend softening the light by diffusing it with something white and transparent, such as blinds, sheets, or curtains. The closer your pet is to the window the softer the light will be. Also, styling plays a big factor in making your pet's photo a success. A good trick is simplifying the background as much as possible, and having a tight color palette is key - whether it's a neutral palette, bright colors, or monochromatic. For example, if your dog is a darker color such as brown or black, surround your dog with a lighter environment and do the reverse for a lighter dog. Before you know it you will have your perfect pet portrait. A secondary option, if you cannot shoot in the pet's home, is to shoot outside their natural environment and personally, I love photographing pets outside, and this is the best place to capture the spontaneous energy of your pet. First, the outdoors offers so many different solutions. You could photograph your pet in your backyard, the beach, or down the street at your local park. However, if your dog is not off-leash trained I recommend using an extra-long leash that is tied to a steak in the ground, you can photoshop the leash out later. This works great if you want to capture a dog running along the beach. Also, the leash will help keep the dog in the same general area to help get a proper read on your exposure. Just watching how happy a dog is to be outside is the most entertaining thing to me. It is very important to have two extra people to helping when doing a photo shoot of your pet. You can recruit your children, significant other, or friends that the dog is familiar with. The first helper is responsible for keeping the pet in position while the second helper is in charge of getting the pet's attention. Ideally, when trying to get the pet to sit, you want them to make eye contact with you and the camera. If you (the photographer) are set up on a tripod, stationed with lighting and background ready to go, then mark an "X" on the spot where you want the pet to sit, so whenever they move from the spot the first helper will reposition the pet and will let go as soon as the second helper gets their attention. If you are photographing a pet that is not yours, you might want to ask the owner ahead of time if their pet is heavily treat or toy motivated. If they are heavily treat motivated, you do not want to bring out the treats until you absolutely have to. It's a lot harder to get the dog to focus once you have brought out the treats on set and you can only give a dog so many treats before they start to lose motivation. So first, try different noises. Whether it is a squeaky toy, a YouTube video, or you yourself actually making noises; try and find new noises that will help get their attention. I often find myself making embarrassing noises such as a dog barking, cat's meowing, or a puppy whining. When making noises, it is important that there is only person designated to being the noise maker because when there are too many people making different noises, you are then confusing the dog. It is also important to note that wherever the noise is coming from, whether it is coming from you, a squeaker toy, or your second helper, that the noise is coming from behind the camera or above the lens, because your pet is going to look towards where the noise is coming from. The same goes for treats. When you are first bringing out the treats, make sure to hold the treat above the lens, very close to the camera, and after they do what you want them to do, give them the treat as a reward, letting the pet know that they are doing a good job. You don't want to tease them because they will start to get frustrated, mad, and confused. And if all else fails, give them peanut butter. Most importantly, check your camera settings. Depending on what level of camera you have, try and do some research on what type of settings would be best for action shots. I shoot with a Nikon D810. It has awesome 3-D Tracking Auto Focus points to help track the focus of moving objects as they move through the frame of the camera. Animals move fast and you sometimes only have a split second to capture their facial expressions. Therefore, you want to make sure you have the camera set to the highest shutter speed possible. Try to not go lower than 200 if you can. By bumping your ISO up, it will allow you to shoot at a faster shutter speed. Or, you could always try it the old fashioned way, with the camera set to a manual focus.